The ACZ-350 work zone crash cushion combines ease of use and NCHRP 350 non-redirective, gating TL-2 and TL-3 impact performance. It consists of an integrated steel nose and water-filled, reinforced plastic segments. Its narrow profile is ideal and has minimal intrusion. 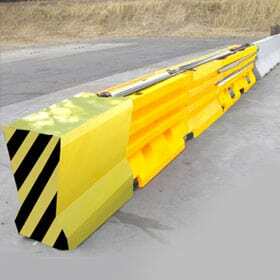 This partially re-useable crash cushion can be easily transported and installed with no roadway anchors. The ACZ-350 can be unloaded and positioned without cranes of heavy equipment. Just position, pin and fill the segments with water. No foundations or anchoring are necessary.